Inspired by an expressed need of Christian education leaders, Fostering Faith reaches far beyond the Sunday school hour or Wednesday evening Bible study. It proposes a shift from education as "schooling" with a goal to increase the learners' knowledge, to a holistic model of education as transformation, which equips and empowers Christian disciples for ministry. 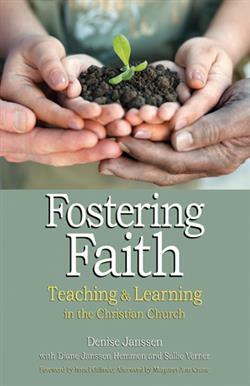 Valuable for clergy, lay leaders, and education ministry members, Fostering Faith seeks to strengthen the vital role teachers play in the church and in the world as learners and disciples themselves. • Highlights the notion that answers are less the goal of education than discerning and exploring the questions. • Presents dual perspectives of teachingas formal ministry in the church and as an organic process as congregations live out their mission. • Contains practical appendices with adaptable resources for Christian education committees and teachers. Sallie Verner, MA, has served five different congregations during her 40-year career as a Certified Christian Educator in the PC(USA). In retirement, she is a facilitator and trainer of Healthy Congregations and coauthor of Healthy Congregations Facilitator Training Materials. Diane Janssen Hemmen, MDiv, DMin, has been involved with Christian education for all ages throughout her years in ministry. An ordained Presbyterian minister, Diane currently serves a small UCC congregation and a mid-sized PC(USA) congregation in South Dakota.